Welcome to Neethlingshof Estate, whose vine roots stretch back to the earliest years of winemaking at the Cape – grapes were already being produced on the farm by 1705. 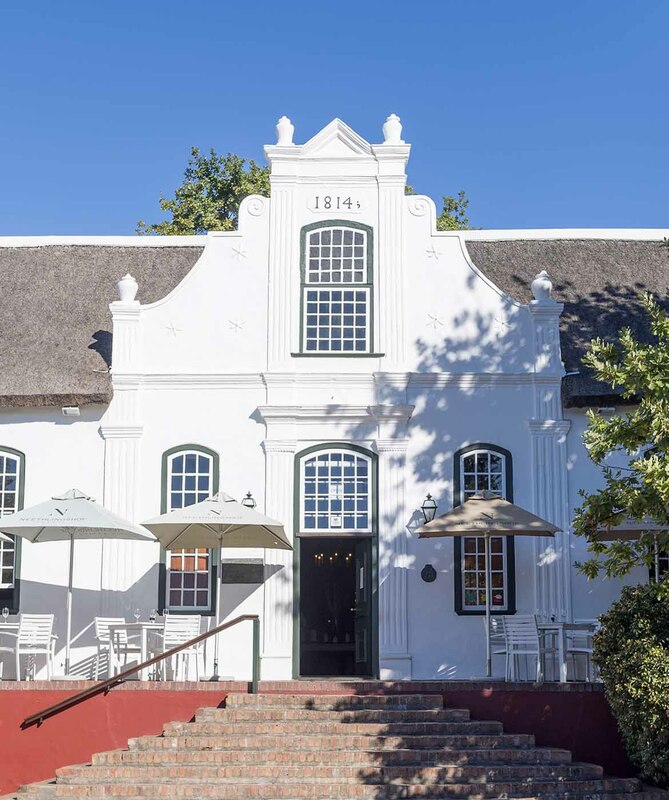 Despite being steeped in history with its thatched Cape-Dutch homestead and outbuildings it has also remained in the forefront of new trends and developments, and has become a leading exponent of the drive to balance nature and wine-growing in the Western Cape. As a consequence its select range of wines is a telling reflection of what is uniquely Neethlingshof. Soil, climate and vines co-exist at Neethlingshof in perfect harmony. Our role in this relationship is to employ management practices that enhance this relationship and thus ensure top vine performance consistently from year to year. The farm is blessed with 8 distinguishable terroirs, each of them characterised by unique slopes, aspects and altitudes and inducing different phenological, physiological and growth pattern reactions in the vine. These occur on a complex soil type pattern. Most soil types, e.g. Tukulu and Oakleaf, are of high to very high potential for viticulture, but a relatively small percentage of medium to low potential soils, e.g. Kroonstad and Katspruit, also occur. The latter soils are mainly used for grazing while the better soils are planted to vineyards. The predominant aspects are South and South-west (open to cool sea breezes every afternoon). Clearly the locality of Neethlingshof enables cool sea breezes from both the Indian and Atlantic oceans to penetrate the vineyards and cool down the grapes during hot summer days. The subsequent slow ripening processes enable all grape components to reach full maturity. Our aim with soil preparation is to create the maximum soil depth, and thus volume, that can be colonised by the vine’s roots. The soils are acidic by nature so this means that the soil must be ameliorated both physically and chemically to allow complete root penetration by both fine and tap roots. In the face of climate change, this is the most important practice through which the challenges of dryer and warmer weather can be faced. Neethlingshof covers 278 ha of which approximately 70% is suitable for top quality viticulture. It contains mostly southerly slopes including south easterly, south westerly as well as somewhat northerly, westerly and easterly slopes. The altitude varies from 65 m to 282 m and huge variations in aspects occur. This gives the opportunity, by correctly choosing the site, to enhance the natural flavour and aroma of any wine grape cultivar. Since 2003 Neethlingshof has been following an active biodiversity orientated strategy in its farming practices. We are moving away from a mono culture of vines and in the process we are giving back to nature some of what we took from her in the past. We are actively promoting the return of the original Renosterveld in areas where vines used to grow. At the same time we leave islands of already growing indigenous plants or actively plant islands of new Renosterveld in the vineyards. Our Wine Tasting Centre and Wine Garden are open 7 days a week for wine tastings, cellar tours and light lunches, while the Wine Shop stocks a selection of wines and other goodies available for purchase. Our Wine Garden is a laid back option for lunch with light meals like pizza, nachos and cheese & charcuterie platters and also hosts our ever popular Wednesday Night Live Music. The Restaurant at Neethlingshof offers a menu of firm family favourites together with more innovative dishes by chef Brendan Stein. The menu is updated frequently, reflecting the seasonal availability of quality local ingredients. The versatility of the venue allows the restaurant to seat guests on the front stoep, under the oak trees overlooking the rose garden with vineyards and mountains as a backdrop, or in the manor house itself. The manor house is divided into three separate dining rooms seating up to thirty guests, ideal for intimate, family or private dining. Renowned as a popular wedding & function venue, the Palm Terrace alongside the manor house is light and airy with beautiful views of the gardens. Able to accommodate up to 160 guests, it is also ideally suited for product launches, conferences, large lunches and cocktail events. Neethlingshof Estate is proud to be part of the Stellenbosch Art Route which was launched in 2018. Neethlingshof is home to a Fine Art Gallery with a selection of excellent artworks in a variety of media. The collection is carefully selected and curated by Corlie de Kock from Knysna Fine Art and gets updated frequently. Currently the gallery is showing works by artists like Henk Serfontein, Danie Nel, Rea Goosen, Beckwith Kraft, Aidon Westcott, Anton Smit, Gerhard Swart, Madelein Marincowitz, Carl Roberts, Lucinda Mudge, Grace Kotze and Robert Plotz, to name but a few. Knysna Fine Art owner Trent Read, who is an expert in contemporary South African art, plays an active role in selecting art to suit Neethlingshof Estate’s unique spaces and atmosphere. The art collection is spread between the manor house and the main building, where a special exhibition artist Brahm van Zyl’s work is the main point of focus.